Karbonn K34* read flash done with volcano tool v2.9.2, Karbonn K34 Star which has SPD Chip set SC6531 and can be read flash and format with volcano tool. 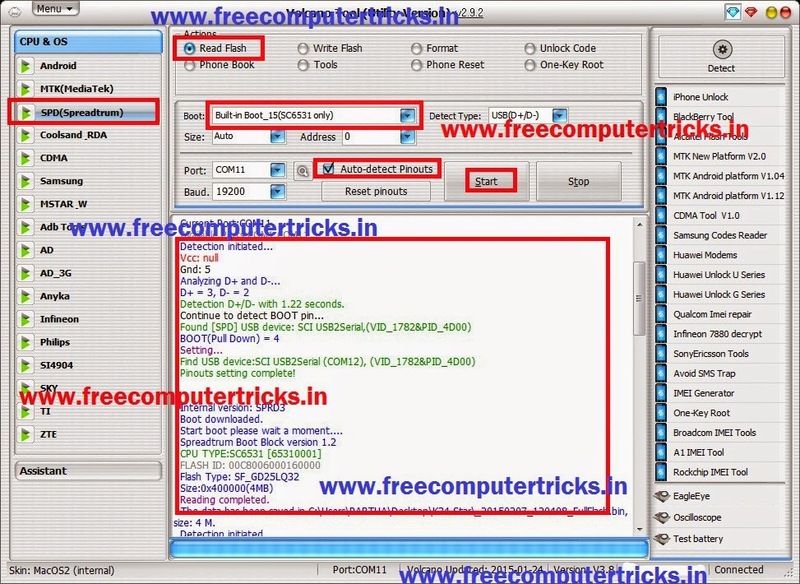 The below is the complete tutorial how to read flash and format SC6531 Karbonn K34Star. Before you format SC6531, first back up the flash file by read flash and then select read flash file and format. To operate SC6531 please use higher version of Volcano tool, as on February 2015 the latest version of Volcano tool is v2.9.2. Detection D+/D- with 1.22 seconds. It's a SC6531 CPU, so you can read and write flash file with Volcano Tool, If you unable to write the file to the phone then there must be some hardware fault on the mobile phone, like it may be the CPU fault. Select the flash file and try to format, otherwise post the volcano tool write flash log file, so that we know the error.